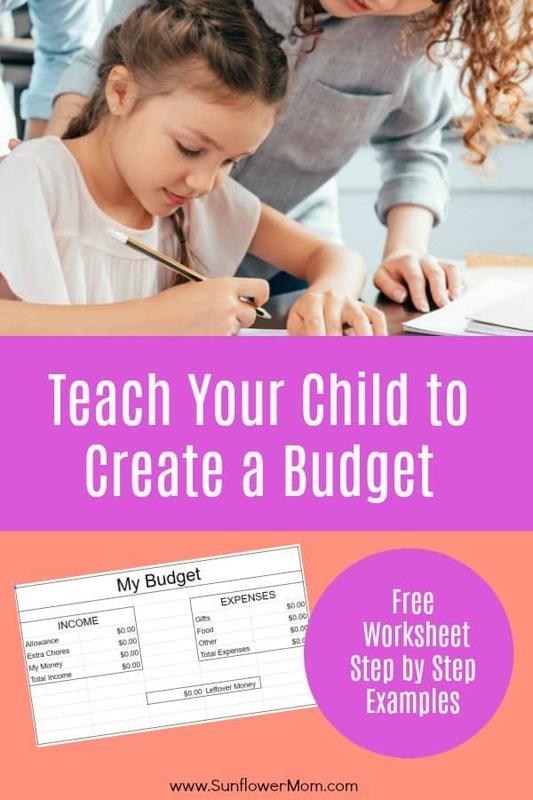 Budgeting for kids is straightforward with this free template. You’ll teach your child the basics of a budget for a short time period, setting them up for success in the long run! When my son was in Cub Scouts he had to create and follow a budget for one of his requirements. It ended up being a such a great learning experience that I also my daughter using this same method you’ll see below. I suggest starting with the end in mind for their first lesson. Children need instant rewards, otherwise, they lose interest quick. 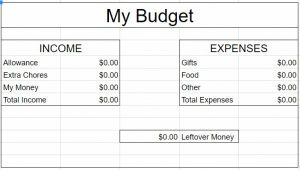 Once your child has learned the basics of budgeting from this exercise, you can ask them to budget for the long term. This learning exercise doesn’t have to be for a new toy they are dying to have. Although that works too. The idea is simply to have your child watch their money come and go for a few weeks. Having an end goal is helpful for the child because they like rewards, but it can be very simple. Vacation – earning money beforehand and tracking the money they spend. Christmas – all the gifts they will buy others. Their Birthday – tracking the money they receive and the money they spend. Have your child cook a meal and budget for the ingredients. Choose a 2 -4 week period to maintain the budget with your child. 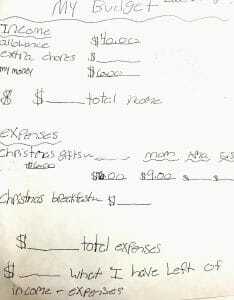 For my children’s budgeting exercise, they set a budget for Christmas gifts they would buy for the family. To begin, you will want to take about 5-10 minutes and sit down with your child and discuss what expenses and income are. Going over your budget at the same time is helpful. It puts everything in a real-world view for your child. Explain the difference between fixed and variable expenses. Using your expenses as an example helps your child relate and may have greater side effects as they realize the resources they are using cost money. My child was 9 at the time and I took the time to explain the difference between fixed vs variable expenses. I didn’t go into great detail. The whole conversation took less than 10 minutes and he was throwing a ball around at the time. It doesn’t have to be a super important talk. Just get the conversation started. Explain how every month you must pay rent or a house payment (fixed expense). You may also explain how a percentage is set aside for savings and charity (ideally fixed). You also pay utilities and a water bill (variable). Then use that opportunity to discuss why it’s a variable expense. Ask your child what can they do to help make that bill lower? Both of my children answered that question. As a result of this exercise alone, one of my children now goes through the house each time we leave and turns off all the lights. She also unplugs all the electronics we aren’t using before we leave for vacation. I didn’t ask her to do this, she now simply aware. Age 8 is not too young to walk through all of your expenses. Children are often shielded from this but it can do them a disservice. I quizzed my children as to whether it was fixed or variable after the first few and discussed how to reduce the variable expenses. Now that your child has the big picture of expense, discuss what expenses they may have during this predefined period. This could involve gifts, grocery items, money set aside for charity or savings, or just something they have been wanting. Again, begin with a real-world view and discuss your income. Where does it come from and how does it come in. Is it direct deposit? Is it the same every month or must you set aside money? Depending on the age of your child, go deeper or stay on the surface. You can gauge this by their interest level. Later, they will ask more questions once you have planted the seed. On your child’s budget, ask them where will they get their income from during this period. Before you answer for them, do they have any ideas? Perhaps they already have some money saved that will be used. Where else will get more – from chores, or will you give them some starting money for the experiment? Now it’s time for your child to track their expenses and income themselves over this predefined period. We used this very simple template. You can get it from the resource library. Just click “save as” then modify the categories as needed. The formulas are good to go. Or do as my children did, and copy it onto a piece of paper and keep track of it manually. Each time they receive money they record it in the income section. Each time they spend money, have them record it on the expenses section. They should have a running total of Expenses and Income at all times. The most confusing part for my children was calculating their net income or “leftover money” as we called it. I had them both write down the formula at the bottom of the page. Income minus expenses. Each time they made a change to their budget (either income or expense), they would need to recalculate how much money they had left in their budget. As your child is tracking how much money they have leftover, have discussions with them about what else they have left to buy. They need to be guided in how to budget their remaining money. If you are using the excel spreadsheet above from the resource library, then you can show your child how they can put in the projected amount for each item and watch how their income goes down as their expenses rise. For my children’s Christmas presents budget, I gave each of my children a starting budget to buy 3 presents and make Christmas morning breakfast. If they wanted to buy anyone else a present, they had to earn the money themselves. Leftover money would be donated. One child spent almost all their money on one present and had just a bit left for the breakfast. The other two presents had to be handmade. The other child had so much money leftover, we donated half of it. Through the process, one child learned how to shop for a present online. He had to find the best deal online and calculate the shipping and tax. The kids also enjoyed looking on Pinterest for a Christmas meal and shopping at the store for everything themselves. Your child’s budget doesn’t have to be fancy. The whole idea of budgeting for kids is that they understand how to keep track of a budget. And eventually, they learn how to do a lot of this in their head.